What does BLEED stand for? 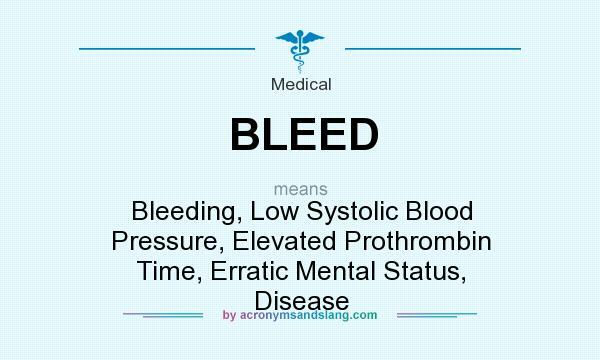 BLEED stands for "Bleeding, Low Systolic Blood Pressure, Elevated Prothrombin Time, Erratic Mental Status, Disease"
How to abbreviate "Bleeding, Low Systolic Blood Pressure, Elevated Prothrombin Time, Erratic Mental Status, Disease"? What is the meaning of BLEED abbreviation? The meaning of BLEED abbreviation is "Bleeding, Low Systolic Blood Pressure, Elevated Prothrombin Time, Erratic Mental Status, Disease"
BLEED as abbreviation means "Bleeding, Low Systolic Blood Pressure, Elevated Prothrombin Time, Erratic Mental Status, Disease"